There's nothing like a nice little trade before the start of the season to shake up the roster a bit. 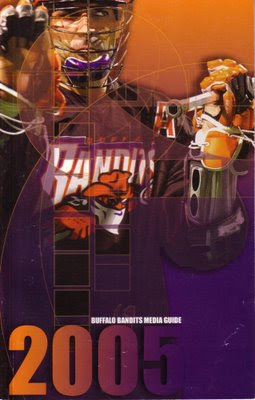 Well, in the case of the Buffalo Bandits, it wasn't so little. The story actually begins in 2004. That's when Minnesota was admitted to the league as an expansion team. It became known as the Swarm. On October 19, the Swarm made its selections in the expansion draft. Dan Teat was considered the biggest name to come to Minnesota. He was taken from San Jose. Then came the trade three days later. The Bandits acquired Teat, Tyler Francey, the first overall pick in the 2004 draft, and a third-rounder in 2004 for Mike Accursi, Kerri Susheski, a first-round pick in 2004 and a first round pick in 2005. Teat was coming off a 34-goal season and wanted to be closer to his Toronto home, so the deal made sense from that standpoint. "(The trade) was something I'd hoped for pretty much throughout the summer. For location, it was better all-around for me and my family," said the 5-foot-11, 180-pound Teat. "Toward the end of the season, it got pretty tough. I have a 7-year-old and I started missing his hockey tournaments and stuff. The wear and tear of three days away and three hours behind catches up to you. They treated us well in San Jose, but still it was tiring." The number one pick in the draft was quite a prize as well. The Bandits used it on Delby Powless, a star at Rutgers University. "He's a proven goal scorer who plays tough, physical lacrosse," Bandits general manager Kurt Silcott said. "We expect him to step right in and make an immediate impact on our team. Accursi, by the way, was then traded to Rochester around the draft. Otherwise, roster changes were few as Teat figured to join John Tavares, Mark Steenhuis and A.J. Shannon as the team's top scorers. Vancouver folded up its shop in December, with the Bandits grabbing Curt Malawsky in the dispersal draft. Malawsky was dealt in January to San Jose for a second-round pick. If nothing else, the run to the championship game the previous season had increased enthusiasm for the team. That was reflected by the 11,067 who showed up for opening night against Toronto. It was the first five-figure home opener since 1999, and the biggest crowd of any type since 1998. Too bad for them that they saw the Bandits lose to the Rock, 15-13. "We just lost our heads in the third quarter," said Buffalo's Jason Crosbie, who had three assists. "We came in at half thinking that we were playing good, but then we got one penalty, then another, then got frustrated. The offensive guys didn't score in the second half and that's on us. ... We need to get our heads back." The Bandits split a road trip that saw them beat Minnesota in the Swarm's first-ever home game. A snowstorm kept the crowd to under 6,000. The next night, the Bandits lost in Colorado. From there, the team went off on a hot streak that put Buffalo in contention in the East. The Bandits swept a home-and-home series with Philadelphia on Jan. 28-29, followed by wins over Anaheim (featuring Taveres' 500th career assist) and Rochester (Tavares' 1,000th career point). A loss to Philadelphia came before a win over Toronto that put the Bandits back in first in the East. "We were able to get the ball out in the open floor and we did some damage with it," said Steenhuis, who added three assists and a team-high 15 loose balls. "Then we were able to shut the door when we had to." Back-to-back wins over Minnesota followed. Tavares had three goals in the opener, and he went past 500 goals in the second game in the Twin Cities. "He [Tavares] makes everybody around him better and makes guys want to work harder," said Teat. "That's all there is to it. That's why he's the best player in the game." The Bandits were slightly derailed by an overtime loss to the Knighthawks. That set up a big game for control of the division against Toronto, and the Rock won it, 12-8. Buffalo only scored two goals in the second half on Rock goalie Bob Watson. "Every year we go through this," said coach Darris Kilgour, whose team lost its final four regular-season games last season. "We come out strong, then start patting each other on the back but forget about everything that got us to where we're at. I hope it doesn't take a five-game slide with us just slipping into the playoffs to realize it." The Bandits did run the table at the end of the season, finishing with a three-game win streak. Buffalo beat Rochester, Calgary to wrap up a home playoff game, and San Jose to finish 11-5. Tavares had another great season with 102 points, Teat and Steenhuis finished with 65 and 62 points respectively, and Powless had a good rookie year with 20 goals and 24 assists. Tavares made the All-Pro team, and Steve Dietrich was goaltender of the year in the NLL -- earning him his first first-team All-Pro honor. The defense was much improved, holding opponents to an average of 10.5 goals per game in the final six regular-season contests. "We had some big changes defensively, but all the new guys who came in learned our system and played amazingly well," said defenseman Kyle Couling, who made his second straight All-Star Game appearance. "This defense is going to be around for quite awhile and in good shape for several years." The Bandits finished in second place in their division, a game behind Toronto and a game ahead of Rochester. That led to a first-round playoff game at home against the Knighthawks on April 23. Despite five goals from Steenhuis, the Bandits' playoff run was one-and-done after a 19-14 loss. It was the team's first first-round exit since 2000. Accursi had seven goals for the Knighthawks. "Everybody in this room had their reasons to be up for this game," said Accursi, who enjoyed beating his ex-team. "For me it was a no-brainer. I wanted to prove to them that they lost a talent. I put my heart and soul into that team for five years and to have them trade me away basically for draft choices, well it was their decision. I lived with it. But I felt I deserved a little more, that's for sure." "I picked a bad time to have the worst half of my life. It's going to be a long summer," Dietrich said. "This is going to haunt me until we get to play them again next year. Until we get that shot, it's going to hurt. Defensively I thought we had our best season, and you don't want to leave it like this on such a sour note." Buffalo had the second-best record in the league, but the best team in the league was Toronto. The Rock proved it with yet another championship, beating Arizona in the final. The season left the Bandits wondering what it had to do to get over the hump.